What if you’ve landed your dream job and you find out you actually hate it. You hate the work, you hate the commute, you hate your boss, you especially hate the ‘you don’t have to crazy to work here’ signs… I mean weren’t those chucked out at the end of the 90s? But you also think this will look really bad on the CV. And also you’ve been told by friends and family that if you stick it out, you might get some good experience and you’ll probably end up liking it. BUT if you really and truly know that this was a big mistake, then it is probably better to cut your losses and start job hunting. There is even a risk that by staying too long in a job you hate, you start to lose motivation and your performance falls. If this happens during your probation – then questions might be asked. Sometimes, when you know the job fit is awful, its better to decide to leave, maybe staying but job hunting (discretely) as you will need to of course maintain professionalism. Ideally you’ll want your current employer to give a reference on how well you handled the situation and your performance during your short stay with the organisation. Leaving a job isn’t as bad you might think it will be – in the long run anyway. Even people who have been sacked within a few weeks into a job have gone onto make a success. Walt Disney started out as a newspaper editor, but was apparently fired because “he lacked imagination and had no good ideas.” We all know what happened after – it was like a fairy story (sorry about that line). You might have an initial love of the place, but if that soon wore off and there was nagging sense you had made a big mistake which then turned into a real lack of motivated for going to work – move on. If you really don’t like something, you know how hard it is to stay motivated and put on a good show. 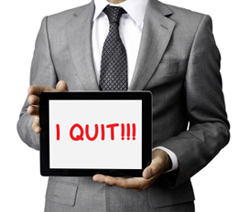 Organisations are generally more understanding that people do leave jobs. The changing economic situation not least playing its part here. They now don’t expect people to stay in one job for years and years to prove commitment and loyalty. Most Heads/Deans will feel that what’s best for you, is often best for the organisation in the long run. A new opportunity may well be much better fit for you, and having one short stint on a CV is not a cause for concern, as long as you can explain it openly and with sound reason. Its only if it happens several times in your career, that people might start to worry when interviewing you. In future interviews its better to be honest about why you left after a short time—that you realised early on that the job wasn’t a great fit, and that you are looking for ….. (infill here with things about the new job/university/company). Honesty (with tact and with respect to your former employer, of course) is the best policy. So if you are finding yourself hating Sunday night as the inevitable Monday morning is looming, just after a few weeks, I think it would probably be better to look for something else sooner.